Longevity - It is said, give a cat three years for every human year and you have an idea of how old he is compared to us. Not so. A cat at one year old is capable of reproduction and fully able to take care of himself. A three year old human is helpless. Such mathematical formulas for understanding the 'real' age of an animal don't work because their internal, and external developments vary and do not correspond to human development. But did you know that the life span of cats seems to be increasing, from around twelve years or so several decades ago to eighteen or more and it seems now not uncommon for cats to live into their twenties? Not only advances in cat medicine but apparently in genetic changes as well are contributing to longer life and some cats live to be much older indeed. Several cats in Southern California have been reported to live as long as thirty and thirty four years. Independent & Loners - Cats are thought to be solitary creatures by many, but anyone who has visited a farm where there are cats will find they congregate in colonies, sometimes nearing twenty in number and seem even to hunt together. There is little fighting because there is always one dominant cat which the others all accept, the rest being equal. At least until a new cat arrives and dominance must be re-established. Cats can't be trained - Training is entirely possible and we have probably all seen on television performance cats trained to walk a rope, roll a ball and even swim underwater. We attribute this to some sort of showmanship business and think our own cats are not trainable. Depending on the breed and the particular cat, they are probably all trainable to some degree and they are certainly able to train us! Particia Moyes, in her book How To Talk To Your Cat, relates how one of her cats and she have a game, the object of which is to remove from some precarious perch - the top of a chair, say, an object, without disturbing anything around and without knocking the item to the floor. The one cat does this with care and great attention, and success. Her other cat, she tells us, takes the game simply to mean, 'get the thing regardless' and will also retrieve the item but in the clumsiest fashion, knocking it to the floor. Ms. Moyes speaks of two other game she and her cats have; fetch and carry and hide and seek. In the first, the person throws a ball of tinfoil (or what-have-you) and the cat returns it, dropping it at the person's feet. The second she says her cat invented. She (the cat) will bring the ball of tinfoil, drop it, then leave the room. Ms. Moyes will hide it, then call her cat who will begin excitedly exploring all the hiding places, find it, drop it and leave the room again. Keep in mind that Ms. Moyes creates and maintains an unusual and unusually close and respectful attitude towards her cats. Very likely, and many pet owners, indeed, parents, have discovered that, the more you anticipate your pet (or child) to be capable, the more capable your pet or child becomes. My own cat offers a less dramatic, but useful example. A stray taken in at about 8 months he at first caused some alarm with his tendency to 'do his nails' on the furniture. I would bang my foot on the floor and tell him no and he'd stop. Now I just tell him, in no uncertain terms, to stop and he does. He only does this when he wants something and I'm not paying attention. In fact, this is one way a cat has to get your attention and let you know he needs something - he does what he knows he is not supposed to do. My cat knows he's not allowed on the kitchen table, for example, but if his food bowl stays empty too long, onto the table he leaps and I know right away he wants feeding. There is an ancient Egyptian papyrus of the twentieth dynasty showing a dog walking on his hind legs, carrying a staff, herding goats. 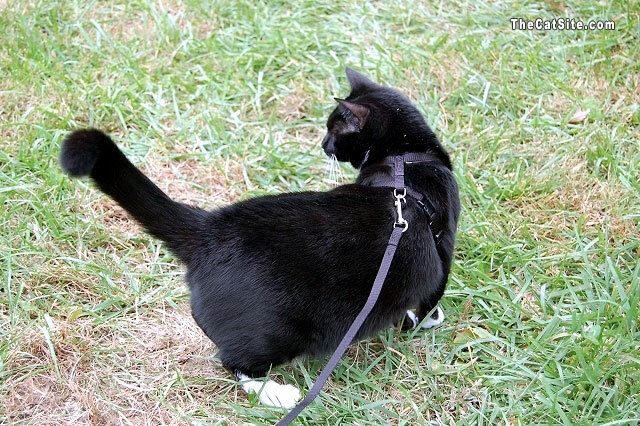 In the same picture there is a cat, walking on his hind legs, carrying a staff, herding ducks. The picture depicts the dog and cat on their hind legs carrying staffs, no doubt, to indicate that they are in control. Were they shown on their fours, one, they could not be shown carrying a staff and two, they would seem to be on the same level as the goats and ducks, not in charge of them. My guess is that one time, before the dark days of cat extermination, cats were trained and used and I expect they themselves were very responsive to this arrangement. Aloof - When one considers the terrible history the family of cats has endured at the hands of man, repeatedly throughout Europe and even in America, it is no wonder the cat keeps himself aloof. Associated with witches, Satan and evil, as a race, cats have been betrayed, condemned, tortured and exterminated, many times, by the thousands and tens of thousands. Those which survived the pogroms passed on their genes to progeny, along with the survival sense to be wary of man. Yet every cat owner knows how truly attached a cat can become and how genuinely grateful they are for the affection and care given them. Cats & Music - Start playing an instrument, even something gentle, such as folk music on a guitar, and a dog is likely to leave the room. A cat, on the other hand is likely to come near, lay by you, roll around, purr and seem to enjoy the sounds immensely. My previous cat used to be my biggest fan, particularly of my fairly elaborate finger picking. My current cat loves to hear the guitar but the obvious deep pleasure he gets from that doesn't even compare to when I pick up the Celtic Harp and play on its strings. I can only describe his state as ecstatic, as if each tiny individual sound washes him with almost unendurable pleasure. Many composers throughout history relate the same story. The famous harpist, Mlle Dubuy, noticed that her cat purred pleasantly when she played a piece on her harp well but cried when she played less so. She used this phenomena to improve her skill. Recognizing how much she owed her success as a harpist to her discerning cat she left him her substantial inheritance and endowed loyal friends likewise to ensure her cat was well cared for. 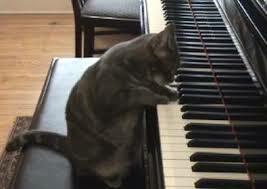 There is a video on YouTube of a cat playing the piano. She is quite intentionally sounding the notes, utterly absorbed in the phenomena. When his mistress plays Bach on another piano the cat stops and listens with obvious appreciation. It is quite as if this cat, and in fact, all cats, truly do appreciate beautiful music and the one in this particular YouTube video, aspires to musicianship. Movement - We all know how agile and flexible cats are - owing to a variety of factors. Unlike man, in whom the vertebrae of the spinal column are held together by ligaments, in cat they are bound by muscle, giving the cat great range of movement. Because of the construction of his shoulder joint he can turn his foreleg in almost any direction. But have you noticed, probably without thinking about it, that there is something funny, something odd in the way a cat runs? 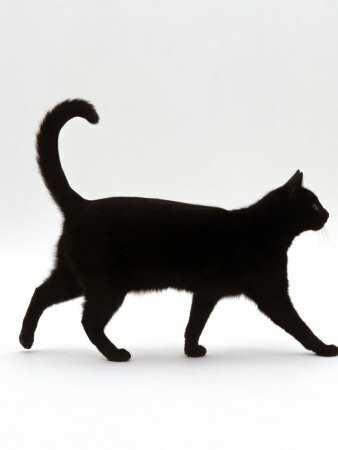 Unlike almost all other mammals who advance by moving the front leg of one side of the body and the back of the opposite, the cat moves front and back legs of the same side. So it's, front, left, let's say, slight pause, back left, right front, pause, right back. The only other mammals said to do this are the camel and the giraffe - and they both have funny gaits too. Food, water and health - Cats can live just fine on dry food. This is a dubious statement many authorities state as being downright false. Cats need meat. They have not the biological capability of taking various elements from a variety of non-meat foods and constructing the needed proteins, which man and dogs can do. And much of the content of dry food, i.e. 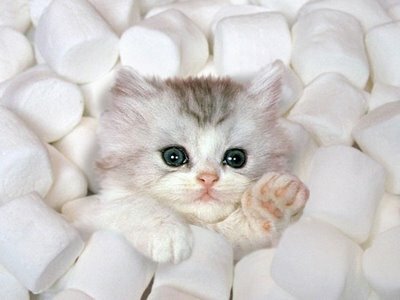 Carbohydrates, not only are not natural foods for cats, they are said to be wholly unnecessary and can be harmful. Meat in some form, usually canned food, is a necessity for cats, not only for the proteins but as well for the water. Cats do not have, as every cat owner has probably verified, a strong drive to drink. Their normal prey is their primary source of water. Deprived of that and not given sufficient wet food a cat can easily, and all too often does develop kidney disease from dehydration. Regardless of whether your cat eats wet or dry food or both, fresh water should always be available to her. Many cat owners have observed that cats are more likely to drink if their water bowl is not located next to their food bowl, which makes sense, as in nature, animals go in search of water independently of their search for food. Also, being clean animals, it may not 'feel' as hygienic to have food and food smells next to their water source. It is also advised to avoid plastic dishes for both food and water. Plastic tends to getting scratched and in those nicks and scratches harmful bacteria can grow. Also, some cats are allergic to plastic and develop skin conditions on their chins when fed and watered from plastic bowls. Still water may run deep - but it still doesn't suit a cat. Almost every cat owner has noticed that their cats love to put their tongues under the tap or even raise their mouths to falling rain. My cat used to put his head under a drip in the bathtub and let the water run to his tongue until we had it fixed - the tub, that is. 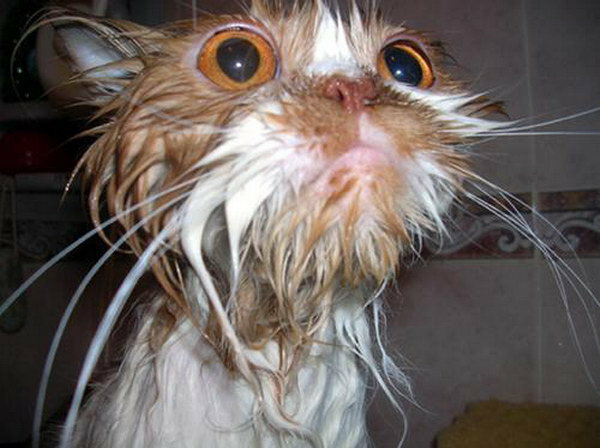 Many cats will drink from any form of water other than still water. Some people, including some vets think there is some molecular difference in moving water. Some think it is the sight of the movement of the water, or the sound. Whatever the reason, (and considering what a big subject this is if posts on the internet are any measure it is a bit surprising that the motivations for this are not better known), cats prefer moving water. This fact has spawned an entire industry of cat fountains, almost all plastic, though there are several sources for ceramic cat fountains and cat bowls. Whether it is one of the plastic fountains or a ceramic cat fountain or cat bowl, all need the same care, which is simply to keep it filled and give it a thorough cleaning regularly. Some sources for pet fountains are listed at the end of this article and if you go to http://www.etsy.com and type in ceramic cat fountains you can find others. I love animals, should have been a veterinarian or animal communicator.